Spahn won 363 games, more than any other left-handed pitcher in history, and more than any other pitcher who played his entire career in the post-1920 live-ball era. He is acknowledged as one of the best pitchers in Major League Baseball history. The Warren Spahn Award, given to the major leagues' best left-handed pitcher, is named after him. His major league career began in 1942 with the Braves and he spent all but one year with that franchise, first in Boston and then in Milwaukee. He finished his career in 1965 with the New York Mets and the San Francisco Giants. With 363 wins, Spahn is the 6th most winning pitcher in history, trailing only Cy Young (511), Walter Johnson (417), Grover Cleveland Alexander (373), Christy Mathewson (373), and Pud Galvin (364) on MLB's all-time list. He led the league in wins eight times (1949–50, 1953, 1957–61, each season with 20+ wins) and won at least 20 games an additional five times (1947, 1951, 1954, 1956, 1963). Spahn acquired the nickname "Hooks", not so much because of his pitching, but due to the prominent shape of his nose. He had once been hit in the face by a thrown ball that he was not expecting, and his broken nose settled into a hook-like shape. In Spahn's final season, during his stint with the Mets, Yogi Berra came out of retirement briefly and caught 4 games, one of them with Spahn pitching. Yogi later told reporters, "I don't think we're the oldest battery, but we're certainly the ugliest." Spahn was known for a very high leg kick in his delivery, as was his later Giants teammate Juan Marichal. [ citation needed] Photo sequences show that this high kick served a specific purpose. As a left-hander, Spahn was able not only to watch any runner on first base, but also to not telegraph whether he was delivering to the plate or to first base, thereby forcing the runner to stay close to the bag. As his fastball waned, Spahn adapted, and relied more on location, changing speeds and a good screwball. He led or shared the lead in the NL in wins in 1957–61 (age 36 through 40). Spahn was also a good hitter, hitting at least one home run in 17 straight seasons, and finishing with an NL career record for pitchers, with 35 home runs. Wes Ferrell, who spent most of his time in the American League, holds the overall record for pitchers, with 37. In 1947, Spahn led the National League in ERA while posting a 21–10 record. It was the first of his thirteen 20-win seasons. 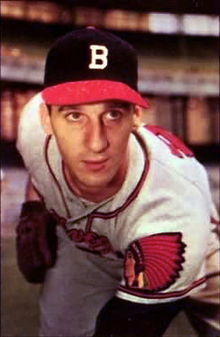 Spahn also won two more ERA titles, in 1953 and 1961. Spahn maintained that "A pitcher needs two pitches — one they're looking for, and one to cross 'em up." He was thus able to maintain his position as one of the game's top pitchers until his 19th season in the sport. This was exemplified by his start on July 2, 1963. Facing the San Francisco Giants, the 42-year-old Spahn became locked into a storied pitchers' duel with 25-year-old Juan Marichal. The score was still 0–0 after more than four hours when Willie Mays hit a game-winning solo home run off Spahn with one out in the bottom of the 16th inning. Marichal's manager, Alvin Dark, visited the mound in the 9th, 10th, 11th, 13th, and 14th innings, and was talked out of removing Marichal each time. During the 14th-inning visit, Marichal told Dark, "Do you see that man pitching for the other side? Do you know that man is 42 years old? I'm only 25. If that man is on the mound, nobody is going to take me out of here." Marichal ended up throwing 227 pitches in the complete game 1–0 win, while Spahn threw 201 in the loss, allowing nine hits and one walk. Hall of Famer Carl Hubbell, who was in attendance that night, said of Spahn, "He ought to will his body to medical science." Spahn's seemingly ageless ability caused Stan Musial famously to quip, "[Spahn] will never get into the Hall of Fame. He won't stop pitching." Warren Spahn's number 21 was retired by the Milwaukee Braves in 1965. Following the 1964 season, after 25 years with the franchise, Spahn was sold by the Braves to the New York Mets. Braves manager Bobby Bragan predicted, "Spahnie won't win six games with the Mets." Spahn took on the dual role of pitcher and pitching coach. Spahn won four and lost 12 at which point the Mets put Spahn on waivers. He was put on waivers on July 15, 1965 and released on July 22, 1965. He immediately signed with the San Francisco Giants, with whom he finished the season. With the Mets and Giants combined, he won seven games for the season—his last in the major leagues. His number would be retired by the Braves later that year. Spahn managed the Tulsa Oilers for five seasons, winning 372 games from 1967 to 1971. His 1968 club won the Pacific Coast League championship. He also coached for the Mexico City Tigers, and pitched a handful of games there. He was a pitching coach with the Cleveland Indians, in the minor leagues for the California Angels, and for six years, with Japan's Hiroshima Toyo Carp. Spahn died of natural causes, at his home in Broken Arrow, Oklahoma. He is interred in the Elmwood Cemetery in Hartshorne. After his death a street was named after him in Buffalo, New York that connects Abbott Road with Seneca Street, through Cazenovia Park, in the heart of South Buffalo. The street is near South Park High School, Spahn's alma mater. A few months before his death, Spahn attended the unveiling of a statue outside Atlanta's Turner Field. When the Braves vacated Turner Field to move into their current home of SunTrust Park, the statue was moved, and now stands outside that ballpark. The statue depicts Spahn in the middle of one of his leg kicks. The statue was created by Shan Gray, who has sculpted numerous other statues of athletes which stand in Oklahoma, including two others of Spahn. One resides at the Oklahoma Sports Hall of Fame located at the Oklahoma City Bricktown Ballpark and the other is located in Hartshorne, Oklahoma at the Hartshorne Event Center. Spahn was selected for the all-time All-Star baseball team by Sports Illustrated magazine in 1991, as the left-handed pitcher. The other selections were: outfielders Ty Cobb, Babe Ruth, and Willie Mays; shortstop Cal Ripken, third baseman Mike Schmidt, second baseman Jackie Robinson, first baseman Lou Gehrig, catcher Mickey Cochrane, right-handed pitcher Christy Mathewson, relief pitcher Dennis Eckersley, and manager Casey Stengel. Spahn was elected to the Wisconsin Athletic Hall of Fame in 1973 and became a charter member of both the Buffalo Baseball Hall of Fame in 1985,  and the Greater Buffalo Sports Hall of Fame in 1991. On April 4, 2009, the facilities of Broken Arrow Youth Baseball, in Spahn's longtime home of Broken Arrow, Oklahoma, were dedicated in his honor. In their Naked Gun films, producers Zucker, Abrahams and Zucker sometimes included joke credits. The trio, who were Milwaukee-area natives, included Spahn in the closing credits once, with the disclaimer, "He's not in the film, but he's still our all-time favorite left-hand pitcher." Spahn also made his acting debut with a cameo appearance as a German soldier in a 1963 episode (S2E8 "Glow Against the Sky")  of the television series Combat! ^ "Warren Spahn Quotes". Baseball Almanac. Retrieved September 6, 2011. ^ Goldstein, Richard (November 25, 2003). "Warren Spahn, 82, Dies; Left-Handed Craftsman of the Baseball Mound for 21 Seasons". New York Times. Retrieved August 18, 2014. ^ Bullock, Steven R. (2004). Playing for Their Nation: Baseball and the American Military during World War II. University of Nebraska Press. pp. 134–135. ISBN 0-8032-1337-9. ^ Camps, Mark (May 9, 2004). "Rare feet: Opposing hurlers steal bases in the same game". The San Francisco Chronicle. Retrieved August 20, 2009. ^ According to the Baseball Almanac, the original doggerel appeared in Hern's Boston Post column on September 14, 1948. ^ Nevius, C.W. (August 17, 1993). "Giants fans have no reason to fear the Braves". San Francisco Chronicle. Retrieved July 10, 2017. ^ "Warren Spahn from the Chronology". BaseballLibrary.com. Archived from the original on March 5, 2009. Retrieved December 23, 2008. ^ "Milwaukee Braves vs San Francisco Giants July 2, 1963 Box Score". Baseball-Almanac.com. Baseball Almanac. July 2, 1963. Retrieved August 20, 2009. ^ "Boston Red Sox vs Kansas City Athletics September 25, 1965 Box Score". Baseball-Almanac.com. Baseball Almanac. September 25, 1965. Retrieved August 20, 2009. ^ "Stamp of Approval". Archived from the original on December 11, 2014. Retrieved December 6, 2014. ^ Bryan Painter, Memories of a Legend and Father March 16, 2008. Retrieved December 6, 2014. ^ "Buffalo Baseball Hall of Fame". Retrieved 29 August 2012.